Yesterday I was up on the southern Golan Heights near Kibbutz Meitsar, less than 2 km from the border with Syria and looking east at the point where Israel, Syria and Jordan touch. 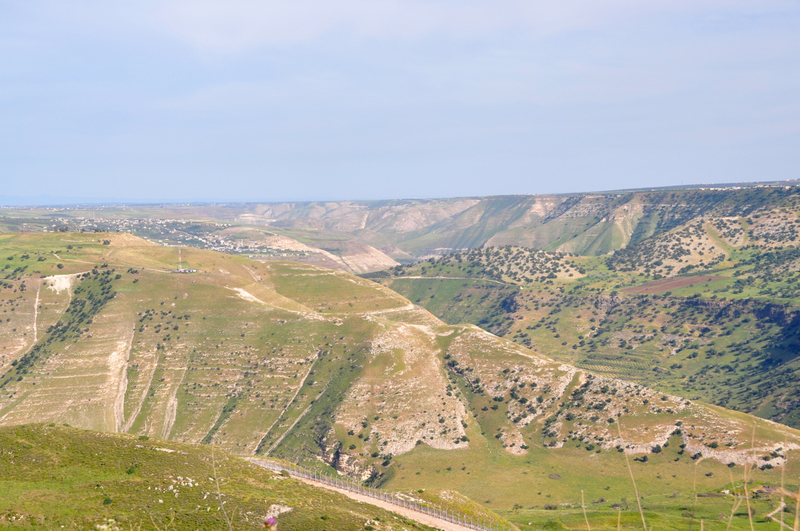 The Rokad river valley separates Israel from Syria – the ridge in the middle of the photograph below is in Syria and the Yarmuk river valley behind the ridge is the border between Syria and Jordan. You can see the new border fence that Israel is building, given the fighting in Syria – in fact, we saw some plumes of smoke to the north, billowing upwards in the distance. Across from where we were standing, near UN post OP55, one of seven observation posts in Israel, is a UN post, one of seven in Syria that monitor the demilitarized zone between Syria and Israel. 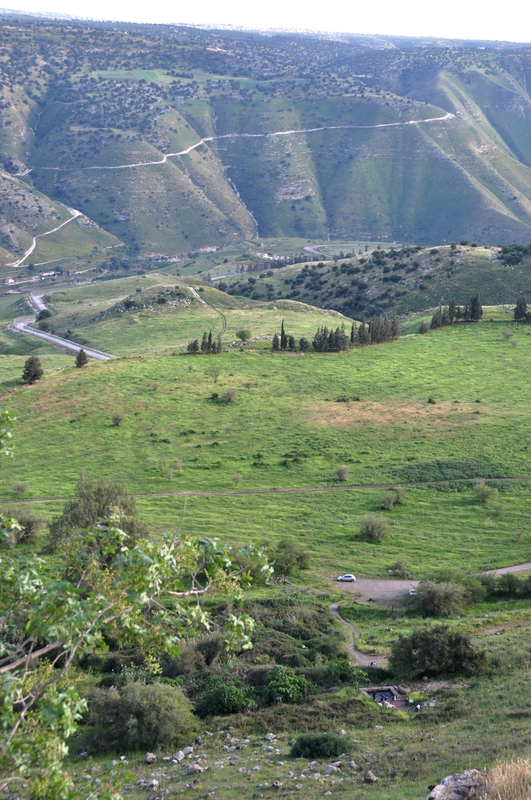 Down below in the valley is Ein Aya, a natural spring that fills a pool, great for a dip on a hot day. 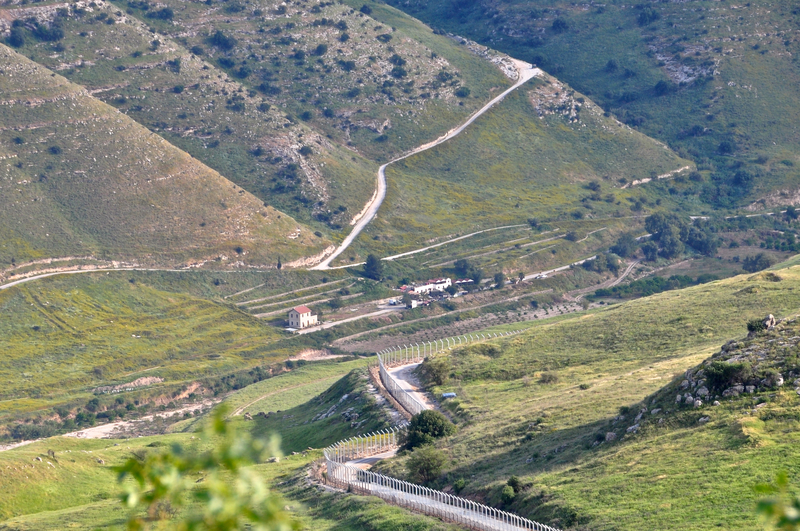 Across the border in Jordan is a two-story stone building with a red tile roof, one of the German railway stations along with the stations at Beit Shean, Tzemach and Al-Hamma (Hammat Gader) for the Jezreel Valley (Rakevet HaEmeq) line that connected Haifa with Daraa (Syria) in 1905.This is the third branch of the ambitious 4000 km Berlin-Baghdad rail project started by Oppenheimer and Meissner after Kaiser Wilhelm II’s 1898 visit to the Holy Land. The Haifa station today houses the Israel Railway Museum that provides an historical overview of railways in the Holy Land and their part in the development of the country – worth a visit. Coming up the Jordan valley after Beit Shean you can see the remains of the German rail line and some of the bridges that supported the tracks. At Gesher, next to the station, is the Mujami Bridge, destroyed on May 14, 1948 by the Israelis to impede the advance of Iraqi and Jordanian troops, the lowest rail bridge in the world at 257.5 meters below sea level. The Naharayim station, in Bauhaus style, was constructed near the hydroelectric power plant built in 1927 by Russian-Jewish engineer Pinhas Rutenberg. 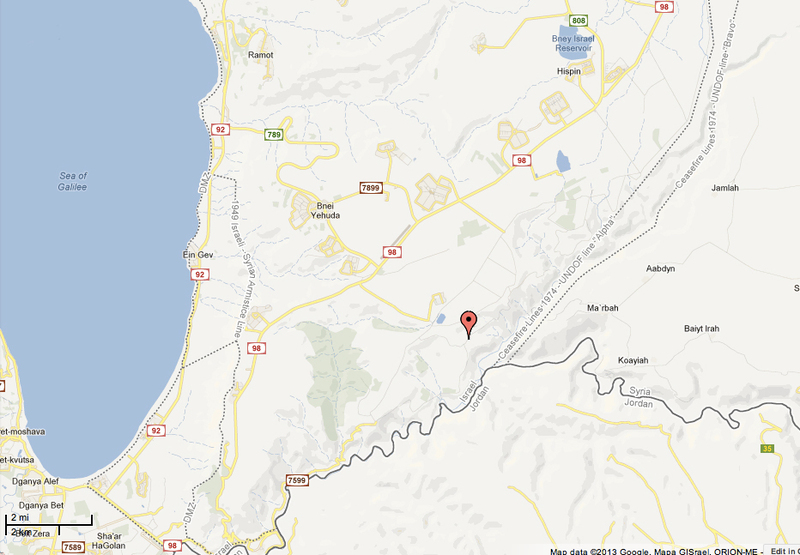 The site was chosen because it is where the Yarmuk river flows into the Jordan river. Gunter Hartnagel has posted a wonderful set of his photographs of the railroad built by the Germans on Flickr. This entry was posted in Nature, Train, Water and tagged beit shean, Golan Heights, Israel, Jezreel Valley, Jordan, Naharayim, railroad, railway, Syria on April 5, 2013 by Shmuel Browns. Wonderful Pictures + Words. Thanks.